Back on May 28th, 2015, the Chicago Blackhawks were getting ready to take on the Anaheim Ducks in Game 6 of the NHL Western Conference Finals, down in the series, 3 games to 2. 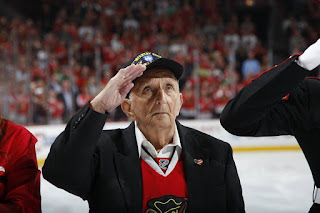 More importantly, Edward J. Holndoner Sr. was being honored as the WWII veteran to stand on the ice for the National Anthem, two days after Memorial Day. When first told, he was hesitant to go He was thinking of the game more so than the real reason for him being there. 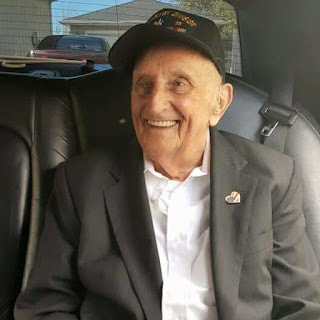 Once he realized that he was going to be honored for his service during WWII, his facial expression changed, and he began to get emotional realizing the opportunity given to him. With some coaxing, he gave in and went to the game. 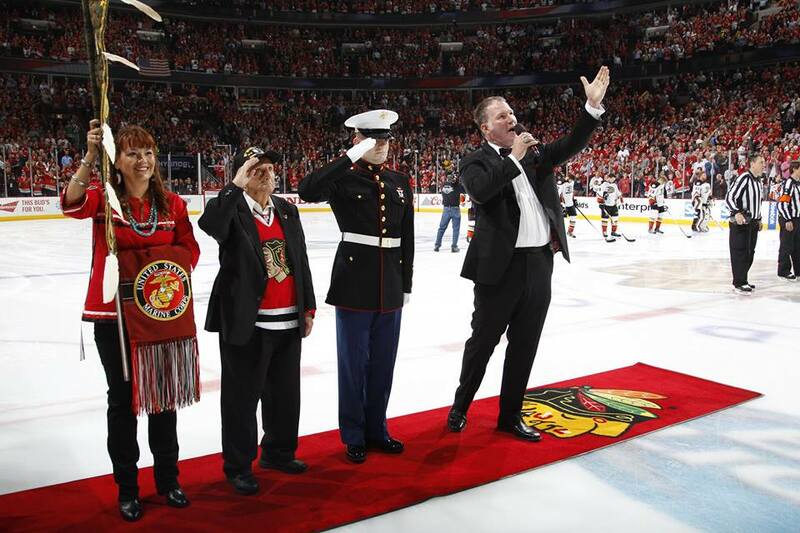 The Chicago Blackhawks, the USO of Illinois, and Boeing, have combined to honor veterans at games throughout the hockey season over the last few years to an overwhelming success. 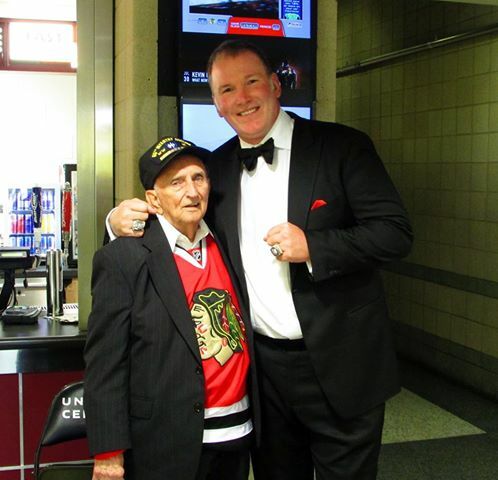 When Edward got to the game, he was met by a Blackhawks official to help provide anything that was needed. During pre-game, a young teenage fan walked up to Edward and gave him a home-red, Jonathan Toews, Blackhawks sweater. He wanted him to have it for his service to his country. The teenager's mother was with him and supported the decision. When it came time to hit the ice for the Anthem, Edward donned the sweater under his suit jacket and his WWII Veteran's hat establishing him as part of the United States Army 65th Infantry Division. 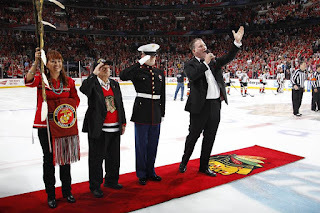 As Frank Pellico began the familiar tune through the pipe organ at the United Center, and as Jim Cornelison started to belt out the words, Edward and the other selected military veterans saluted, and the Chicago fans erupted into a thunderous applause, as they always due, for the most memorable 1:48 in all of Blackhawks pre-game hockey. As Edward made his way back to his seat, he was greeted by countless fans thanking him for his service. His seats, provided by the Blackhawks, USO of Illinois, and Boeing, gave him a great view of the game. In the middle of the 2nd period, during a commercial intermission, the Blackhawks paid tribute to Edward and the other military veterans that were present. Once again, the Blackhawks faithful paid tribute to a thunderous roar. Even the players on the ice were giving recognition for their service with stick-taps on the ice. When the night ended, the Blackhawks had forced a Game 7 back in Anaheim. As history tells us, the Hawks went on to take Game 7 and then the Stanley Cup in 6 games against the Tampa Bay Lightning. But for Edward, who was brought to the game by his family in a stretch limo, he, at 91 years old, stated that "I will remember this day for the rest of my life. This is one of the best days I've ever had". Edward passed away last week, but till his dying day, he showed great pride, for one of the most memorable days of his life. Thank you to the Blackhawks, the USO of Illinois, Boeing, Jim Cornelison, and the Blackhawks fans for giving Edward a day that lifted him on top of the highest mountain for a day. And thank you for being the best Dad that a son could ever have. Love you, Dad! Randy what a wonderful tribute and special memory you will always have of your father. Thank you. :) Everything about it was amazing. I truly think it added a few months to his life. He was on dialysis at the time.